How are you? How were your days when you were detained at secret National Intelligence Agency? How you spend your time during your days and nights in prison? There are certainly violent inmates, how you defend yourself, how you protect yourself? I have so many questions to ask you. We will have long conversations when you are out of prison. Coming soon. Since the first day of your arrest, your secret detention, when you appeared before the courts in Kinshasa and your transfer to Makala, I have kept thinking that your freedom is coming soon. I have hope, and nobody can take it away. It is this hope that gives life. This challenging adventure is just a year, but the passage of time has not affected my convictions or my commitment that I share with you and all the other activists. The power of your resistance is felt by me and by thousands of young people around the world. This prison sentences for trying to be a good citizen makes me become strong in facing the injustices that you are forced to become the symbol of. Your courage is exceptional because you now walk the path of death, and you will not loose. 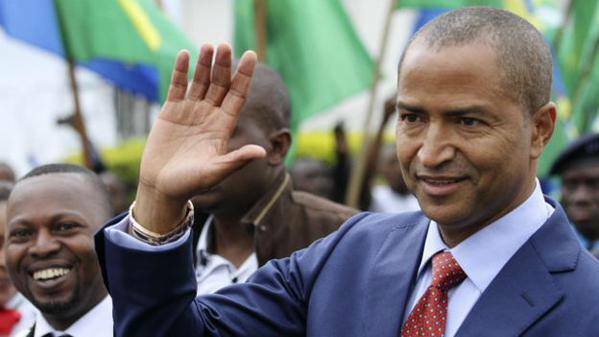 The little phrase that you sent me from your cell Makala finally reached me … I repeat to you and to me and to all activists who are still willing to risk their lives for values and to replace the unacceptable and abnormal that have become the rule of the Congolese system. We move forward, some in prison and others outside prison. I’m not so free in this Europe that is locked within its own walls. The miss the intense life of home, I miss very much our talks with your animated voice and surprising ideas. I miss Goma, I miss my country. I miss you. I plan to come back soon to see across the beauty and misery of my people, this is the ultimate therapy after those days outside my country, away from my mission. Laugh with those who laugh, cry with those weeping, struggling with those who struggle. You know, I never imagined that loyal acts cold lead to prison for long periods, while leaders of armed groups who killed and who killed our fathers, our mothers, our brothers, are always rewarded with political positions and military ranks. Wheeler-soldiers, and politician embezzlers of public funds circulate freely. I never imagined that you would you be imprisoned and accused of such great things and venture the biggest award. You do not know measure the anxiety that I had listening to the charges mounted in a big deceitful piece against you. It’s amazing that a state, our state has become so oppressive to us, its own youth. Now a long year has closed. It dreams of your liberation. It’s too small as a dream, but I am condemned to it. Our dreams were splendid! Ecology, health, entrepreneurship, change the system. I no longer think as before. With you in jail, I dream of your liberation. We dream small to be realistic. Now that the electoral mandates are being worn away, they are not ashamed of wanting to change the rules of the game and stay in power. Our fight is reduced to requesting releases and seeking political interventions despite clear provisions in the Constitution for freedom and democracy. You, you are on the front line of all fronts. We tireless ask for your outright release and at this one year mark, we still have not received anything. It should not happen like that, they should not take you away, they should not imprison you. Everything was wrong from the start. It’s hard to fight for the release when the accusations are false and fabricated and even the arrest of the person was unfair. Non-violence, dignity, responsibility, the famous « Take up the struggle » and « risk together » and yet they trampled our unconditional love for our country and all the motivations and principles that drive us to fight to build a Congo that looks like us. Your sacrifice imposes many meanings. Your imprisonment gave a deeper meaning to our history. It reveals the animosity of the current ruling class. You are the living testimony of the dictatorship that was hidden under the democratic institutions facades. Those who run the institutions had not understood that the generation of the president-for-life has grown old and we are now in the Democratic Republic of Congo. That democracy is the rule. The Constitution is the guide. You bear the suffering from this painful transition from dictatorship to democracy. For the ruling class, the contradictory discourse of the different authorities sometimes verges on humour. I have a feeling they are touched by the courage and determination of young people, although they are not yet able to overcome their avarice. I invite them to visit you to know you more. I think if they met you, if they took the time to listen to you and talk to you, they would apologize for having called you a terrorist; they would ask forgiveness for these days they steal from your life. From a distance when I fixe my gaze to the Congo, I see your predators agitated as passengers who are on a boat that is sinking. Their incendiary speech about us rings in my ears like rather coarse distress calls by individuals. And I always say, we must not let them die, we must do our part to make them aware of their inordinate selfishness. So, the speeches of politicians encourage me to take up the struggle even more. Your imprisonment has highlighted the role of the security services and those of the Congolese information that will mobilize when they suspect that the interests of some people in danger. Their intuition is often wrong. As for the specific case of our movement, it is the interests of the people that count. Your imprisonment has unleashed languages: issues related to the change of the constitution have become constant news and you the eternal scapegoat that is pulled by for and against democracy. I no longer count the numbers of press conferences of the government about you! And convictions and concerns of States and organizations in the defense of Human Rights on the situation of democracy in our country. Your jail has opened a series of arrests of youth of our movement. I realized that we are in the sights of those who keep you in jail, they want to destroy us. They want to discourage young people from taking responsibility for the country’s future. Day by day they take bad decisions against us and unfortunately against themselves. If I were them, I would not celebrate me. They use too much energy to destroy us when we are too small, young single people. To annihilate us it would be enough to respect the country’s constitution and leave us alone. But when they mix unfairly all institutions of the country for their interests, they mobilize the people in the struggle, they attract to us all media organizations and human rights. In a word, they occupy too much of our advertising and our training in democracy. For example, in judgments on the Congolese justice I trusted lawyers, but there, without asking advice to lawyers, I can give concrete and personalized case to prove that the retributive power, the mother of the nation « justice » is no more independent. It became a mass destruction weapon in the service of executive power. It’s annoying but that’s it. For us, the consequences are severe: Trésor Akili, Gentil Mulume, Sylvain Kambere et Vincent Kasereka have faced months in prison. They were sentenced to 6 months suspended sentences for mobilizing people to join Filimbi to support you and the cause of democracy. Then the despicable imprisonment and unjust convictions of Juvin Kombi and Pascal Byumanine and 7 companions for taking part in mourning ceremonies for slain citizens in Beni. And despite all their responsible citizenship, Serge Sivyavuha, Justin Kambale, Ghislain Muhiwa, Mike Kamundu et John Assyenda et Rebecca Kavugho are being imprisoned on wrongful convictions. And Bienvenu Matumo et Thierry Kapitene were taken and have joined you in Makala prison do without organizing anything or saying anything, or doing anything wrong. And my friend Yves, how is he? I did not know him before he was arrested, but now I carry him in my heart. I look forward to meeting him. You know that with them, you are my hero. I could write to all my friends to express my feeling and join them in this difficult time. But that will have to wait. Your imprisonment has also taught me that we are not alone. That young people of Congo and the entire world are with us on the open Facebook page in solidarity with you and Yves Makwambala, we saw young photos of all races, from all continents scribble on their bodies the famous #FreeFred #FreeYves hashtag on Twitter, we see the popular #FreeLucha born! It is encouraging to feel support! My dear friend, you must know that in my eyes, you are a free man even in prison. And promise me that even there you must fight for your survival at least. The fight seems long and hard. Always take care of yourself. Fighting at least not to die. Do not accept dying either physically or intellectually or morally. Before I finish, let me tell you a joy: Fred, we are the people we dream, we are young people who are building, with bare hands, the future of our country, at the cost of our blood. With pain and dignity, we are building the country of our dreams without any protection, without substantial support. Now, our democracy will no longer be an exported ‘copy and paste’ system of political lobbying. We are the witnesses and actors in our work. While we’re at such a low level on the scale that we have to climb up, but with fire in our hearts, we go … however long it takes, we will get there. The path we have chosen, that of nonviolence, of respect for the dignity of the person, of responsibility and independence, love, education, of responsible citizenship, is the longest but it is most effective. It will happen… The pride of our people, one day it will be nobly found. I am sure, because we exist, because you prove it by braving the greatest fear, death. All members of our movement risk death by remaining in the country where the current government does not just want to take care of the most basic problems of the people and instead of fulfilling its obligations, it targets us for elimination. It takes courage to continue the fight and to survive, to be brave and express what you think. I also try to be this. You have the support of many people who are tired of injustice. I’m glad to I met you through LUCHA and have you as a friend. I’m happy that through the struggle, I met a person as special as you, a young Congolese man who has the greatness to bear the challenges that have fallen upon him. In a few days will be your birthday, for this special event for your family and for your friends and for all those who love you, I offer my support and I confirm you that you can still count on me. I pray for you and for our struggle. MANIFESTATION ce vendredi 9/10/2015 à ‪#‎Goma‬ contre intervention Rwandaise en RDC. Rappel : La manifestation pacifique se tiendra devant le quartier général de la Monusco à Goma (vers le lac, où opère Radio Okapi) à partir de 8h30. Rejoignez une jeunesse qui refuse de subir l’histoire de son pays, mais est déterminée à en être un acteur incontournable ! L’avenir de notre pays s’écrit maintenant, unissons-nos forces pour l’écrire ensemble, par nous-mêmes ! Besoin de contact ? Nos coordonnées se trouvent ci-dessous. 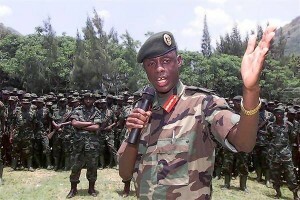 Photo : le Général James Kabarebe, ancien Chef d’Etat-major de l’armée rwandaise et actuel ministre de la défense du Rwanda. Responsable de multiples crimes graves sur le sol Congolais. La problématique des FDLR et des réfugiés Hutu rwandais ne sera jamais résolue par des armes. 1 – Notre mouvement citoyen suit avec beaucoup d’inquiétude les allégations persistantes depuis plusieurs semaines d’une possible nouvelle incursion de l’armée rwandaise sur le sol Congolais, avec l’accord voire à l’invitation du gouvernement Congolais. Nous avons recueilli plusieurs témoignages dans ce sens de paysans et d’autorités locales de plusieurs villages des territoires de Nyiragongo, Rutshuru et Masisi. D’expérience, nous savons que ce ne serait pas la première fois, et que les raisons avancées toutes les fois précédentes pour justifier une intervention de l’armée rwandaise sur le sol congolais demeurent quasi intactes, tout comme la facilité avec laquelle elle a pu intervenir par le passé, avec ou sans l’accord du gouvernement congolais. 2 – Ces allégations sont renforcées par la circonstance des déclarations et des résolutions signées à Kigali le 23 et le 24 septembre dernier, lors de la réunion des ministres Congolais et Rwandais de la défense, avec le concours des services des renseignements militaires respectifs des deux pays. Dans ces résolutions, les deux gouvernements affirment vouloir « renforcer la collaboration militaire » pour résoudre le problème des FDLR. Non seulement les modalités de cette collaboration sont inconnues, mais les Congolais, et les habitants du Nord-Kivu en particulier, ont fraîchement en mémoire les atrocités dont ils ont été les premières victimes lors des « opérations conjointes Umoja wetu » de 2009, qui ont causé plus de tort aux civils congolais qu’aux FDLR qu’elles étaient censées cibler. 3 – Nous voulons réaffirmer ici, de manière solennelle, à l’intention autorités de la RDC, des organisations de la sous-région et de la « communauté internationale » notre ferme opposition à toute nouvelle intervention de l’armée rwandaise sur le sol congolais, sous quelque prétexte que ce soit ; par quelque résolution que ce soit. La population du Nord-Kivu s’y opposerait par tous les moyens légitimes ! 4 – Nous demandons à la CIRGL et à la MONUSCO, conformément à leurs mandats respectifs, d’enquêter sérieusement et immédiatement sur ces allégations persistantes de présence de l’armée rwandaise sur le sol congolais, en associant les autorités et la société civile congolaises, et de rendre public leurs conclusions. 5 – Le problème FDLR ne sera jamais résolu par les armes. Il faut qu’il y ait pour les FDLR, comme pour tous les autres groupes armés et rébellions, des alternatives crédibles à la traque armée. Les combattants et les réfugiés Hutu rwandais sont des êtres humains à part entière, qui ont le droit d’avoir des aspirations politiques dans leur pays. Penser que le fait pour le gouvernement rwandais de se déclarer toujours « prêt à les accueillir » et à « leur assurer une intégration socio-économique réussie » n’est pas seulement irresponsable, c’est une insulte à leur humanité. C’est comme leur dire : « allez chez vous, oubliez votre doit d’opinion, d’expression, d’association, … et contentez-vous de planter vos champs et de manger à votre faim ». Encore que même cela est relatif ! La « communauté internationale » doit absolument peser de tout son poids – et elle en a les moyens – auprès des autorités rwandaises pour qu’elles garantissent au minimum l’ouverture de l’espace politique, l’équité de la justice et le respect des droits fondamentaux, notamment les droits civils et politiques. C’est à cette seule condition que l’on pourra dire aux réfugiés rwandais qu’ils peuvent retourner dans leur pays sans crainte et à y exister politiquement pour ceux qui le souhaitent et à qui la justice n’a objectivement rien à reprocher. 6 – D’autres options pour les réfugiés rwandais et les combattants FDLR ayant déposé les armes (et à qui la justice ne reproche rien objectivement) existent et pourront être explorées. Mais le point de départ doit être la démarche énoncée ci-haut. La « communauté internationale » et toutes les parties impliquées doivent choisir entre le courage d’oser la seule solution durable, le péril de la résignation et l’irresponsabilité des demi-solutions. 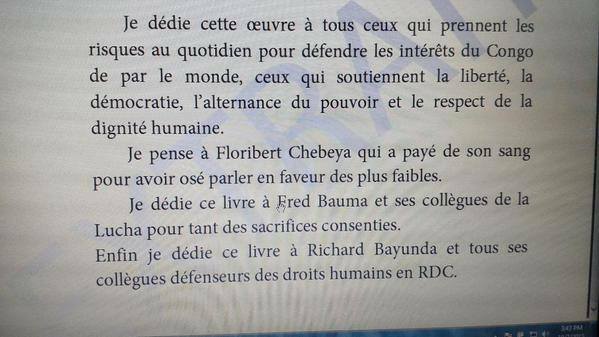 De leur choix dépendra la fin réelle et durable des violences récurrentes à l’Est de la RDC, où la présence des FDLR et des réfugiés rwandais est, à n’en pas douter, un considérable catalyseur. Fait à Goma, le 08 octobre 2015. Hommage au Dr Oscar Mastaki, enseignant à l’ULPGL, N-ième victime de l’insécurité organisée par les autorités à Goma. Monsieur Oscar Mastaki (42 ans), enseignant à l’Université Libre des Pays des Grands-Lacs (ULPGL) a été porté en terre ce mardi 6 octobre 2015 au début de l’après-midi. Il a été tué par balle la soirée de dimanche 4 octobre par des « hommes armés non autrement identifiés », alors qu…‘il partageait un verre avec des amis dans un bistrot au quartier Katoy. Des cas de meurtres, assassinats, vols, braquages, enlèvements, incendies criminels, … sont malheureusement très courants dans la ville de Goma, prétendument « ville touristique » et « vitrine du Nord-Kivu ». Le comble c’est que les autorités ne font pas grand chose pour remédier à ce problème, comme si toutes ces vies perdues ne valaient rien. Chaque jour, chaque nuit que Dieu fait, des morts sont par balle sont recensées. Souvent les éléments de l’armée ou de la police, actifs ou « démobilisés », sont auteurs de ces crimes. Souvent aussi, les autorités parlent « d’homme armés non autexpriment leurs opinions, critiquent l’action (ou l’inaction) ou la complicité des autorités, bref, exercent leur simple droit d’opinion et d’expression. C’est dans ce contexte qu’un officier à la réputation sulfureuse, en la personne du Colonel Blaise Dimundi (PNC) vient d’être installé officiellement comme nouveau commandant de la Police pour la commune de Karisimbi. Cet officier a été chassé par la population de la ville de Butembo, toujours au Nord-Kivu, qui l’accusait de crimes de sang, de crimes économiques, de brutalité et d’autres actes graves contre la population. Ce genre de décisions ne peut être interprété que comme une défiance vis-à-vis de la population, et une volonté expresse de participer à son malheur. Le gouverneur et les autres responsables de la province et de la ville sont avertis. Cette situation ne va pas durer indéfiniment. L’heure vient où la population va s’assumer. Les étudiants de l’ULPGL, parmi lesquels se trouvent plusieurs militants actifs de la LUCHA, organisent un sit-in au gouvernorat du Nord-Kivu le jeudi 8 octobre 2015, pour dénoncer l’insécurité à Goma et la léthargie des autorités pour y mettre fin. Nous appelons tous les habitants de Goma, spécialement toute la communauté estudiantine, à se mobiliser à leurs côtés afin de faire entendre notre exaspération. Enfin, la LUCHA présente ses sincères condoléances à la famille et aux proches de M. Oscar Mastaki, à tous les camarades étudiants de l’ULPGL et toute la ville de Goma. Le Congo va changer…avec sa jeunesse éveillée et déterminée !rement identifiés », comme si ce n’était pas leur responsabilité de s’assurer que seules les forces de l’ordre ont des armes et s’en servent pour protéger les citoyens, et non pour attenter à leur vie et leurs droits. Dans tous les cas, ces mêmes autorités (les appeler ainsi est déjà un abus de terme !) promettent des enquêtes, des poursuites, etc., qui aboutissent très rarement. Face à cette situation, il n’est pas rare que la population se rende justice en tuant des voleurs et des tueurs chaque fois qu’elle arrive à les attraper. Malheureusement il arrive aussi que des innocents fassent les frais de cette « justice populaire ».